CHESAPEAKE CITY, Md. 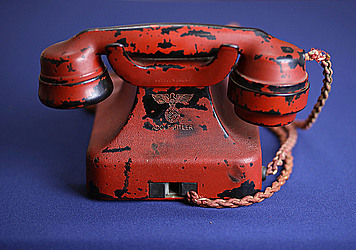 (AP) — A Maryland auction house is selling Adolf Hitler's personal traveling telephone. Bill Panagopulos of Alexander Historical Auctions in Chesapeake City says occupying Russian officers gave the phone to Brig. Sir Ralph Rayner during a visit to Hitler's Berlin bunker. Rayner's son is now selling the red phone with a Nazi party symbol and Hitler's name engraved on the back. The phone is estimated at $200,000 to $300,000 and Panagopulos says bidding will start at $100,000 this weekend. Panagopulos considers the phone a "weapon of mass destruction," noting that the orders Hitler gave over the phone took many lives. He says the seller and auction house hope it ends up in a museum, where people who see it "really understand what extreme fascist thinking can bring about."